Here in Ohio, we still haven’t had a frost so I’m still bringing in the harvest. This week, I’m ready to collect juniper berries. Our juniper shrub has played an important part in our farm since the very beginning. It was much smaller when we moved in, but nonetheless, was the best shelter on the property for our very first bee hives. The mockingbird, for which we named our farm, nested in the juniper just above the hives that first year and we took it as a good sign. Junipers grow in most parts of North America. They aren’t too picky about the soils in which they grow, with the exception of their dislike for an extremely wet one. Because they can tolerate extremely dry conditions, you may have met a juniper even if you live in the city. They are often planted near sidewalks and streets. They don’t need much in the way of maintenance, so no need for a grounds crew to keep them trimmed. Even the berries, which are small and abundant, lure the birds to come and fetch them instead of gracelessly cluttering the yard. Juniper berries have a long tradition of use in food, beverages, and medicine. I wrote some weeks ago about the fact that they are the main flavor in gin. In Norway, where my family originates, it is common to home brew with juniper berry tea. You’ll find recipes that include juniper berries with meat, especially fish. Just a few are used, and they are usually crushed to release their flavor. It is said that they make a domestic meat taste like their wild counterparts. In medicine, juniper berries are recognized for both their high content of volatile oils and their beneficial resins. It its common to see them applied to issues in the respiratory tract and urinary tract. Therefore they can be useful for such issues as cold, congestion, cough, urinary tract infections, arthritis, and gout. They are fairly intense in their action, so only small amounts are used. NOTE: Juniper berries aren’t a tonic by any means, so the use of them over long periods of time isn’t advisable. The use of the berries for anyone with only one kidney, or someone with kidney disease, is not advised. Our juniper bush towers over us these days. It has grown from a modest six feet to easily 11 feet over the past 15 years. I won’t bother picking any of the berries above my head. In that way, I can leave some of the berries for the birds. Juniper leaves are sharp, so it’s best to use gloves when picking juniper berries. The time-honored way to pick is much like mulberry picking. Place a sheet underneath the shrub, grasp a branch with berries, and gently shake. The berries will fall off quite easily. You are looking for only the blue, ripe berries. Anything green will rot before it dries. After gathering the berries, it is time to dry them. It has turned rather chilly and humid here, so I’ll most likely use the dehydrator. It takes quite a while to fully dry a juniper berry because it is highly resinous. You can expect to allow them to air dry for up to three weeks or at least two days in the dehydrator. This winter, I’m looking forward to experimenting with some juniper rubs for outdoor barbecue. If I decide to use the berries for medicine, they can be tinctured, powdered, or made into tea. 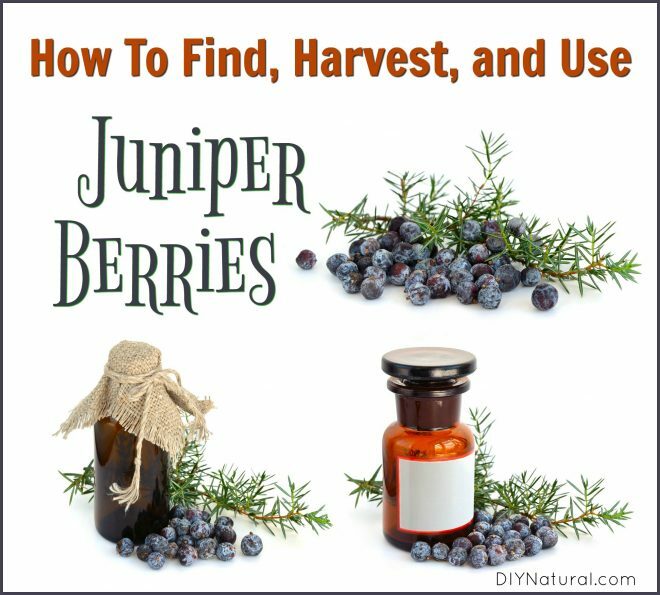 Want juniper berries, but don’t have time for a DIY? You can find organic dried juniper berries here for a reasonable price. Have you noticed a juniper shrub in your area, covered in blue berries? Have I inspired you to take a closer look? Can I freeze the juniper berries? Do you use whole dried juniper berries to make tea? If so what measurement? Question: Is it okay to gather juniper berries after a frost and/or freeze? We’ve already had 17 degrees F here. I always wondered which tree has the Juniper berries on them. We have lots of Eastern Red Cedars which have berries on them. They say they are not true Cedars, but are Junipers. Do you know if it is the same tree you are talking about?